Please welcome Rita of Mochachocolata-Rita as a guest blogger on Rasa Malaysia. Rita is an Indonesian who currently resides in Hong Kong. Whenever I visit her blog, I feel “jealous” that she is constantly traveling and eating around Asia (she loves to shop, too!). As a true Indonesian, Rita shares with us her mouthwatering and tantalizing sate recipe, and outlined the steps involved in making authentic sate (photos in the gallery). Her sate is seriously great looking and I can’t wait to try her recipe! Living in Hong Kong, I am blessed with plenty Indonesian restaurants. Missing my home country’s food? No worries, they’re just a short MTR ride away. However, finding a great Indonesian sate dish is proven to be challenging. 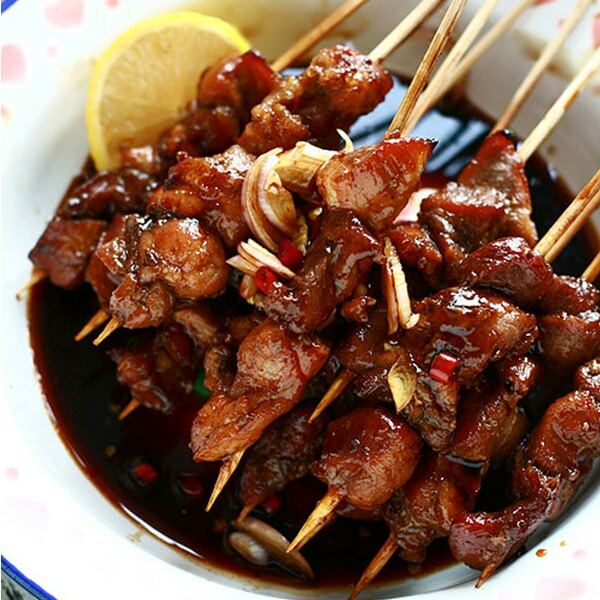 Most places simply deep fry their skewered marinated meat and call them sate. My Hong Kong friends thought these “Hong- Kongized watered down Indonesian sate” were yummy, until they tried mine. I developed the recipe based on the Sate Babi/Ayam Kecap I always ordered from my opposite neighbor when I was young. They came out pretty close. I promise you, those sate were the ones that made me spend my teenage years being not-so-svelte, despite the extra fast metabolism. So, I’m sorry, baby. You’re never going back to those deep-fried-meat-on-a-stick no more. Lots of kecap manis Indonesian sweet soy sauce. You want them to be almost drowned in this. I made two different sauces. One is kecap manis sauce which is the same as the baste and peanut sauce. Marinate for a few hours, or for best result, let it marinate overnight in the fridge. The next day, stick the meat cubes with the bamboo skewers. I stick 4-5 pieces of meat cubes per sate. If you’re using meat with fatty bits, mix fatty and lean meat cubes in each skewer. I made the sate for a BBQ party, so I could grill them on a charcoal grill, which is the best scenario. However, if you don't have one, it’s not the end of the world; you could make a pretty decent sate with an oven. Simply preheat oven to 200C, place the sate sticks on a baking sheet and grill them until you see some burnt bits. Please do not deep fry some sticks of meat and call them sate, pretty please? Before grilling, squeeze a bit of lime juice over the sate. The sates are done when the meat feels a bit firm (not rock hard), shrunk a bit, and beautifully caramelized. Process everything in a food processor until well mixed. To serve, place the peanut sauce on a plate, add a dash of fish sauce, drizzle generously with kecap manis, and squeeze juice of a lime. I omitted chili from the sauces as some of my friends don’t eat hot food. Feel free to add one of two freshly chopped chilies in the sauce. Bathe your freshly grilled sate in one of the sauces and serve (optional = serve with steamed rice or lontong/rice cakes). Remember to soak those bamboo skewers in water for at least 1 hour to prevent them from burning later. I soaked mine for a good few hours; they kinda look good in the vase, eh? I should use them to decorate my flat. I made two versions of sate, pork and chicken. It is best to get meat with a good amount of fat in it; the fatty bits will make the sate tender and juicy. However, if you’re on a low fat diet (hold your tears), no worries. I made a few sticks of lean and mean sate made of skinless, boneless chicken breasts for sous chef, who’s on a low fat diet, and my other friends ended up eating them too. They were that good. For those of us that CAN handle the heat, what is cabe rawit and do you add it to both the marinade and the basting/dipping sauce? This looks great! Going to make it this weekend. cabe rawit = bird’s eye chilli. they are tiny and super hot. chop a few pieces (test the heat with just 1 chilli first ^_^) and add to the dipping sauce. wait for the moment when you bite into them….and whoa! hottt! I love sate but haven’t tried Indonesian sate. This looks really good, yummy! oh yum it looks good !! I’ve always had Satay, malaysian style with spicy peanut sauce but not Indonesian style..
Great Sate recipe btw. I wasn’t familiar with Indonesian Sate.. but now i am! :) back home in indonesia, each of us could eat about 20 sticks of these babies. oh yeah! Great looking sate babi, right down to the enamel plate. I agree with the need for cabe rawit (bird chilies, which are sliced and added to the marinade/sauce–it looks like one or two may have been snuck in). That looks so good! I’ve heard so much about Indonesian sate from my dutch friend who gave me kecap manis so this may be a good time to try making it myself! Oh man, this sounds delicious! The marinade is so rich with flavor. I agree, the bamboo skewers do look kinda cool as a decoration! The light coming through the window in that photo looks gorgeous too. sate babi is rather hard to find here in Malaysia, for obvious reasons. and served with some peanut sauce with chopped pineapples. tangy, but a little weird, if i may say so myself. Growing up in the Washington, D.C., in the 50s/60s, our family’s favorite dinner dish was “Pork Sates,” the recipe for which my mom found in some cookbook long forgotten. We pronounced “Sates” as one syllable with a long-a sound. Years later, we learned from a Washington Post article by the wife of the Indonesian ambassador that the dish we loved was very similar to Indonesian “Satay” (with a two-syllable pronunciation and “ah” pronunciation for the “a”). I look forward to making your recipe and comparing it to my family’s “sates” and my now-wife’s Malaysian satays. Many thanks for posting this recipe! I’m just wondering which pork cut did you use here? I was just thinking that maybe I could use pork shank to make my sate babi, what do you think? Will it make a juicy and tender sate still, or a tough one? Thank you for the recipes. So far I’ve tried char kway teow and KL hokkien mee, and yes they were superb! Oops, I forgot to ask my other question. For the amount of sauce and marinade sauce up there, how many lbs/kiloes of meat was it for? Is there a substitute for the sweet soy sauce? Would brown sugar or molasses added to the soy sauce work? 1. How much meat is the marinade good for? 2. I swear the first time I made this I heated the peanut sauce to carmelize the flavors a bit. And I thought there was lime juice in it as well. Am I going crazy? Thank you again for the gift of this recipe! My satay turns out rock hard when it cooled a bit, what did I do wrong? ? You might have overcooked it. I have seen several people asking how much kg of meat u used, but so far you have not answer one of those questions. So here goes mine :P. How many kg did you use ? Authentic sate is roasted close to the fire and served medium to medium rare. Also in the street version and little sate stands the meat is often basted with the peanut sauce while cooking which gives a delicious roasted flavor. My mother was born in Jakarta. For Christmas I wanted to give her memories from when her father was alive and we would spend the day stuffing wantons and skewering chicken for satay. Thank you for your recipe. It is the only satay recipe I will use, very close to my grandfather’s. Unfortunately he died without sharing his recipe. Thank you for helping me give my mother a wonderful Christmas gift.